MOH and I left the area where we had stopped to hike (shorelines, remember? ), and we steered steadily south—south to south by east—between the steep eastern face of the Wassuk Range and Walker Lake's western shore. 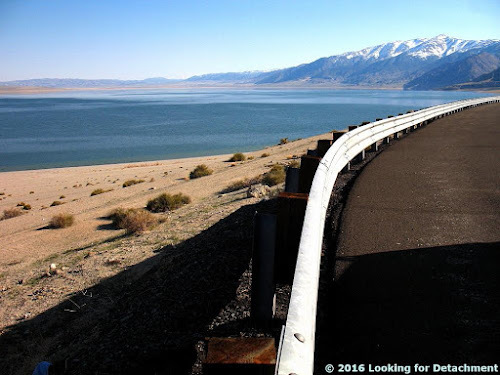 It can be hard to drive by Walker Lake without stopping for photographs, though I find myself doing that more often than not. Sometimes the lighting is off, with the sun high in the sky or at the wrong angle, other times the lake and mountains are obscured by a pervasive haze. Consequently I have few good photos of the lake. I got lucky in the spring of 2008. Between a rock and a guardrail: the steep eastern side of the Wassuk Range, looking north along Highway 95. I've always found this precipitous range front fascinating when driving past at 40 to 60 mph (o_O)—the granitic rocks along the range front look shattered, presumably munched by the Wassuk Range fault zone—but I've rarely pulled over to examine anything closely because of unusually minimal standing room on the inboard side of the highway. 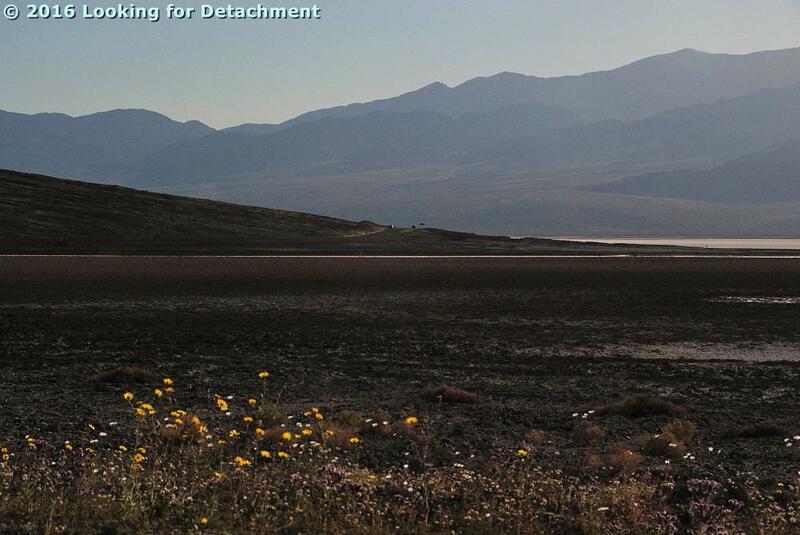 Looking south toward Hawthorne from a pullout near what is now the north end of Walker Lake. A strangely stitched agglomeration of six photos. Notice the pronounced shorelines in the foreground and in the distance on the left. For some reason I found the whole having-to-stop-in-Hawthorne situation just almost too much to handle, even though the city used to make you drive into town no matter what. Now there is a bypass. Then there was a great little Shell station at the downtown corner where you turned left after stopping at the town's single red light. It was a perfect opportunity to get excellent gas. We pulled back onto the 4-lane part of Highway 95 near the west edge of Hawthorne and turned right onto the bypass. Two things come to mind when I go through Hawthorne. First, I'll remember a dream I had once where I took the Hawthorne bypass and drove around town, north to south, and the bypass itself seemed to be the whole point of the dream. Second, after turning east onto Highway 95 at the south end of the bypass, my mind will go into a driving reverie and take me back to a time in the late 80s. 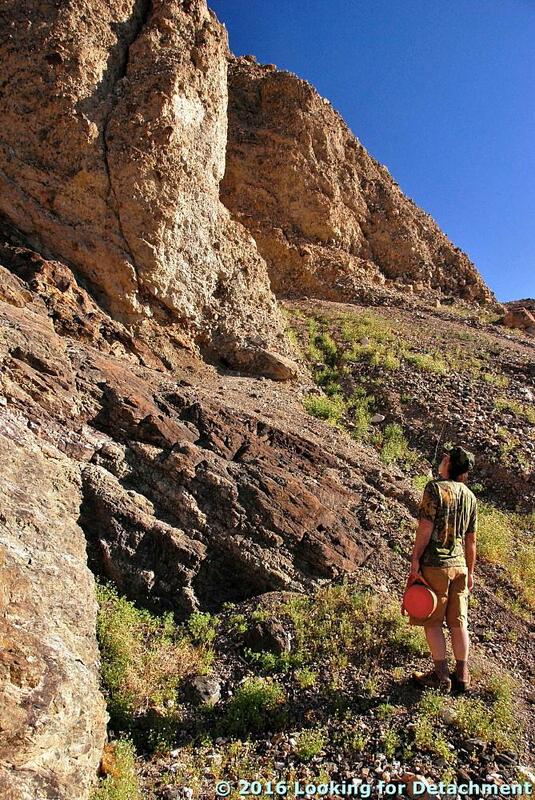 I was telling someone that if I had enough money, I would quit my work in minerals exploration and just go out and map. Here or there. I'd seen a lot of places I thought were interesting, and I loved mapping. So, I'd just go out and map. And I'd start a map publishing company. My unnamed sidekick said that mapping should have a point. Like I shouldn't just go out and map; maybe instead I should try to figure out something in particular about the geology of the area. I disagreed. 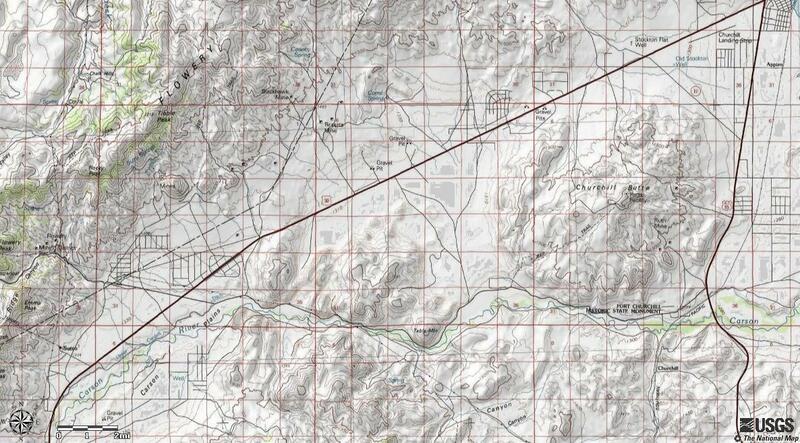 The USGS mapped tons of quads and the whole point was getting the entire area (the West? the U.S.?) mapped. My mapping would be more detailed than quad mapping, and I would just go out and do it. 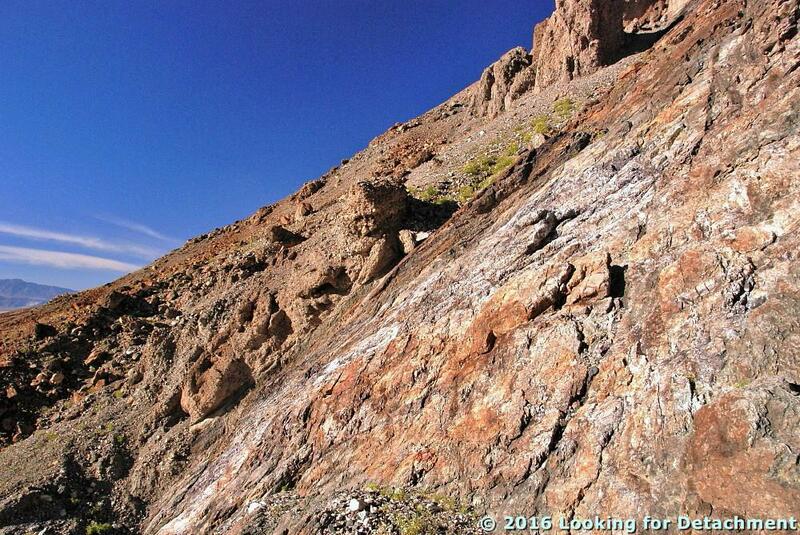 Maybe I'd start right there—up ahead in the volcanic rocks near the pass outside of Luning. Maybe I'd start at any of several places I'd already done some detailed mapping, part of the point being to make the mapping available to the general population of geologists working in the area, not just to one exploration company. 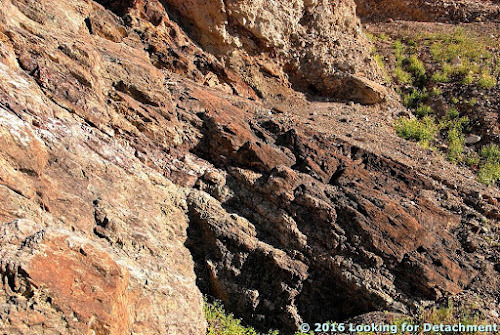 Volcanic rocks in the Benton Spring area of the Gabbs Valley Range, about 7 miles north of Luning. I drive east, my mind goes into this same reverie, and I remember that time—and how, when it came down to it and I had some money and some free time, I didn't do that. MOH and I drove into Luning, and rather than stop at the Luning Rest Area, we took a dirt road going toward the hills of Black Dyke Mountain, accidentally choosing a road that would have eventually delivered us to the Blue Ribbon Mine. 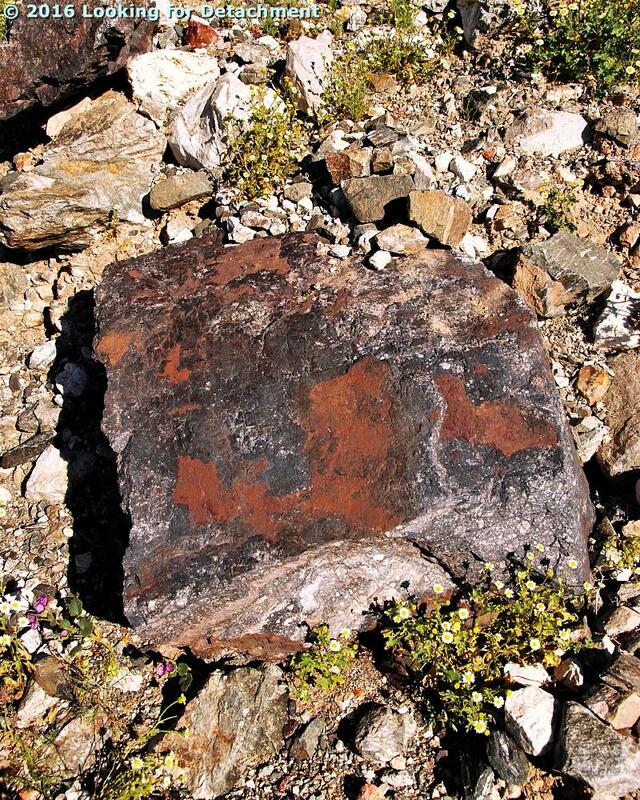 It was in this area that I learned how to test for the presence of copper in black Mn-oxides by using cold, dilute HCl to plate copper onto a rock hammer. This method tests for copper wad or neotocite (a hydrated Mn-silicate sometimes containing enough Cu to be considered an ore mineral), or a few other black copper minerals such as chalcocite and tenorite. Folded, contorted rocks in the hills less than 2 miles SW of Luning. Zooming in on the folds. And that's it for this part of the road trip! 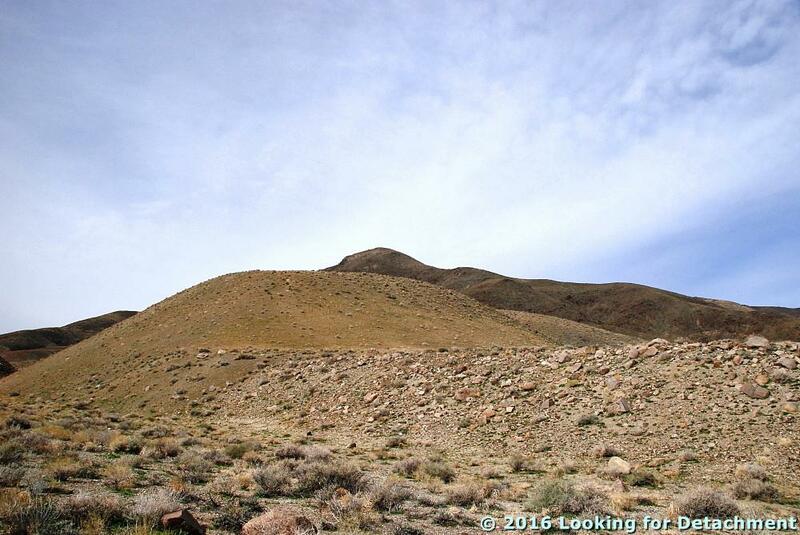 We'll continue on towards Tonopah and Beatty next time. It's not a pyramid, unlike the three pyramidal objects (#1, #2, #3) I posted about a couple years back. It's actually a frustum, in this case a pyramidal frustum, one based on an oblique, irregular, triangular pyramid. That is, it's a "chopped" triangular pyramid. 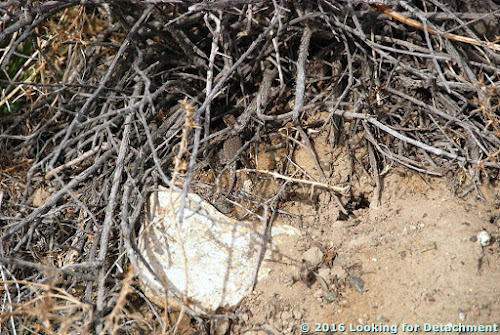 The rock itself was on an alluvial fan not far from Walker Lake; it was pointed out to me by MOH, who spotted it on our second-day hike to some Pleistocene shorelines. Although it was lying on a grusy soil amidst large granitic boulders, the rock looks porphyritic. I don't know if it's a porphyritic version of the granitic intrusive rock lying around, or if it's extrusive in origin. 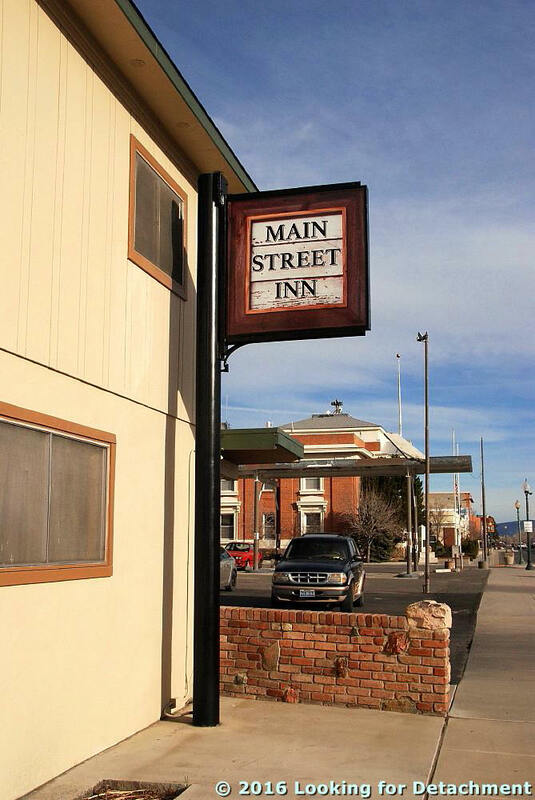 On the second day of our road trip (which began here), we left Yerington at a reasonable though not early hour, knowing full well we'd make Beatty by dinner time. 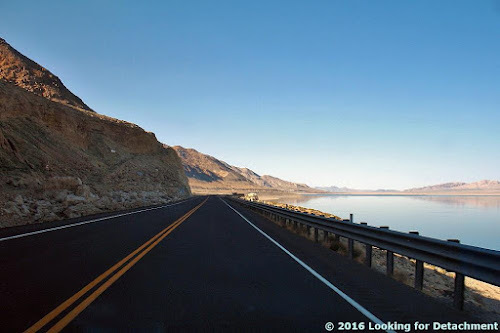 About an hour later, after reaching the Alt-95–95 junction near Schurz and while still approaching Walker Lake, we found an opportunity to stretch our legs and see some geology in the process. 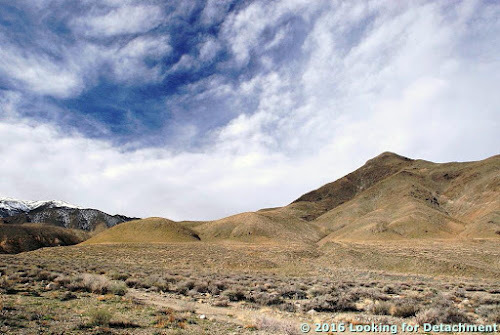 We pulled into a side road leading to a gravel pit...and noticed a dirt road heading straight for some terraces, which I think are either tufa-cemented Lake Lahontan shorelines or a fault scarp. 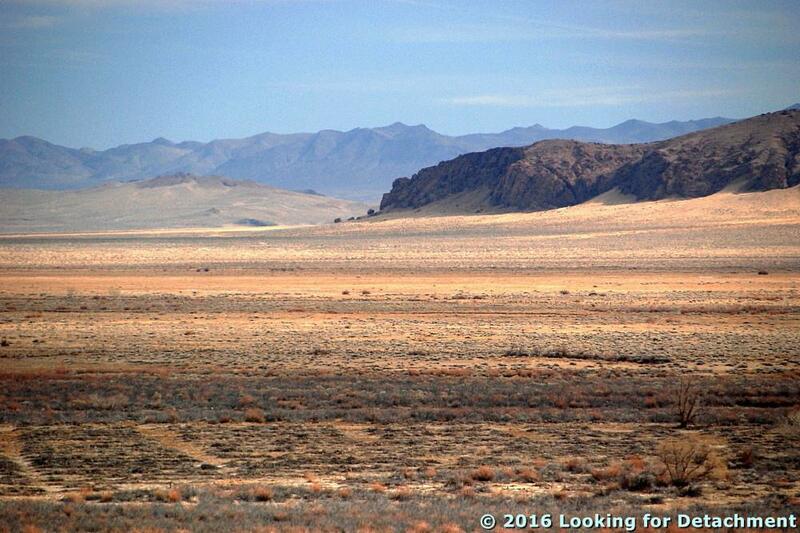 These are some relatively low hills along the range front in the northern Wassuk Range. But then we found the old highway, which was built above a historic highstand of Walker Lake—one that must have been at about 4060 feet, below Walker Lake's historic highstand that occurred in 1868 and was between 4089 and 4108 feet—and we left the gravel pit, driving north and looking for a dirt road to take us to the range front. Here we're looking NNE along the old highway, toward some brightly colored, possibly hydrothermally altered rocks in the northern Wassuk Range. Oh yeah, I'm a sucker for old roads! We found a dirt road, one heading toward the canyon way to the left (below). Our goal? The Lake Lahontan shorelines and apparent Lake Lahontan high strandline on the rounded hill near the left. We're looking southwesterly toward the range front. A zoomed view of what look like shorelines. One range-front fault may be at the base of the slopes at the bottom of the photo. It's unclear to me from Google Earth how faults and shorelines are interacting. The same range front and shorelines, looking more to the northwest. Hike, hike, hike...hike, hike, hike. After about 15 minutes, I arrived at a boulder-strewn shoulder just below what I think is the highest Pleistocene shoreline. 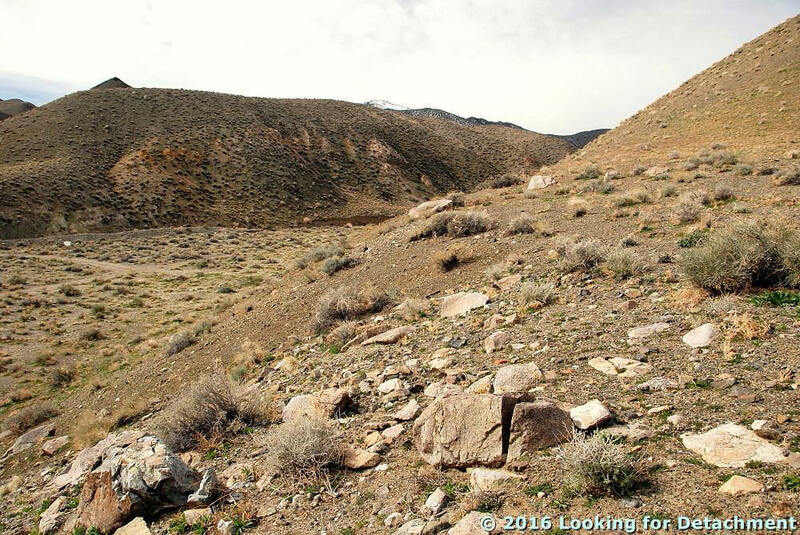 We're looking west toward Reese River Canyon (not the same Reese River as in central Nevada). The canyon looks worthy of future explorations. 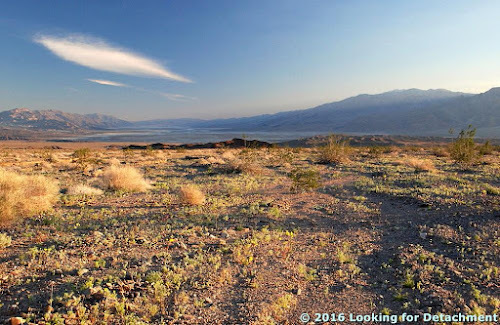 Now I'm standing on, as near as I can tell, the highest Lake Lahontan shoreline, looking to the south. 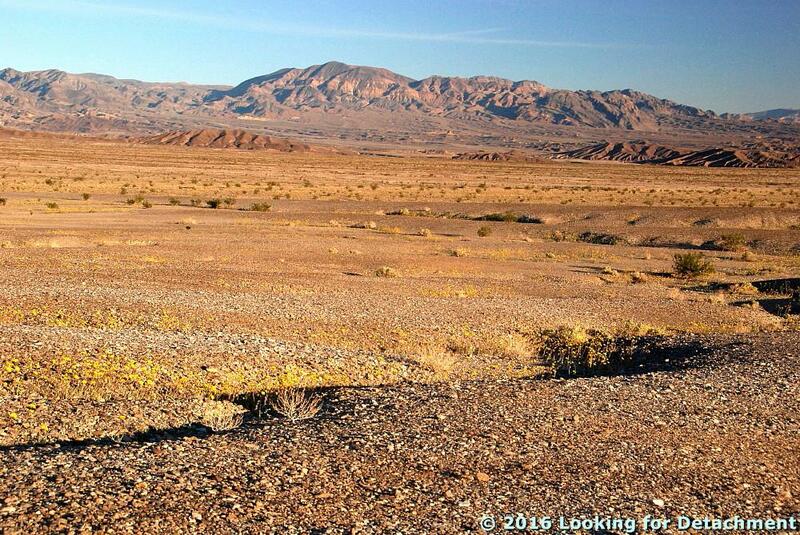 What's that across the dry wash? 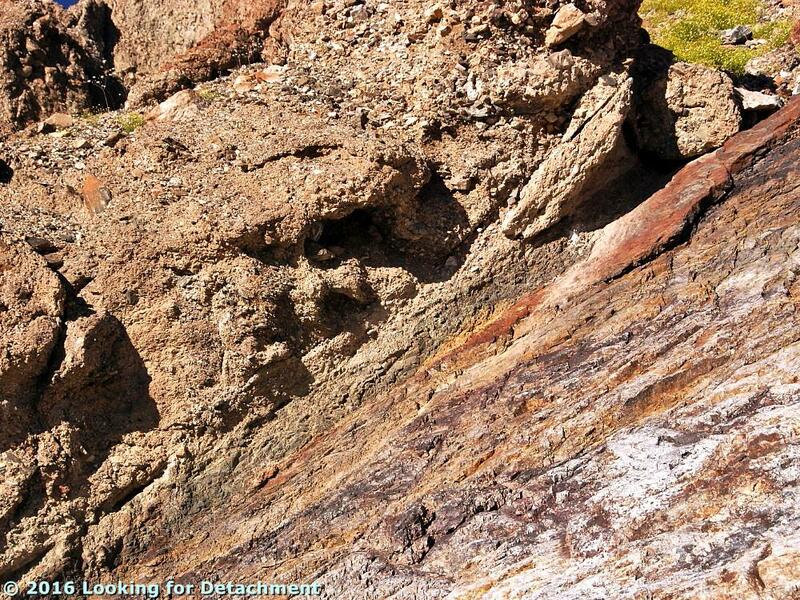 Zoomed in, we can see a contact: poorly sorted Quaternary deposits above orange-brown hydrothermally altered rocks. Is that a fault? Is it a sedimentary contact, either related to fan material being deposited along the range front or a wave-planed shore? I can't answer that question without going back to investigate. MOH went on ahead to the top of the hill. The highest ancient shoreline (Sehoo age) looked to me to be at the flat area I was standing on, just about at the often reported elevation of 1332 m (4370 feet), although the next slight break in slope—the change in color just below MOH—coincides with a strandline reported elsewhere of 1338-39 m (about 4390-4393 feet). Looking to the north, we can see this same break in slope (the one I was standing on), with some ancient shorelines below it (especially to the far right). Note the change in color—green above to yellow below. 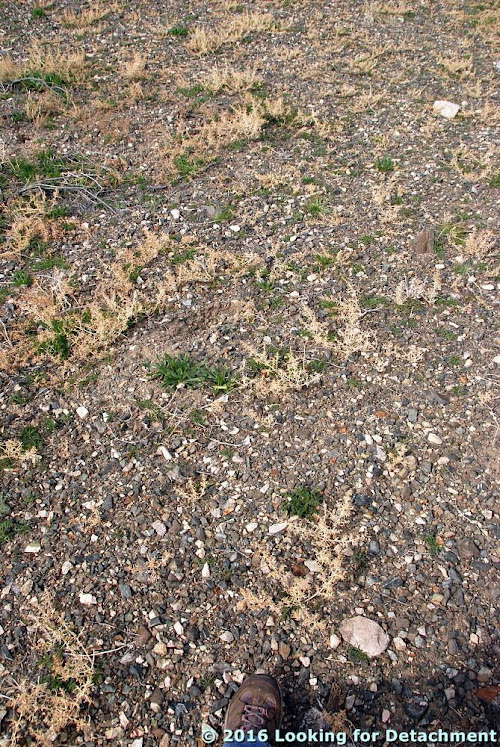 The yellowish or straw-colored areas along the break in slope are from a closely spaced, dried-out plant, probably Halogeton. 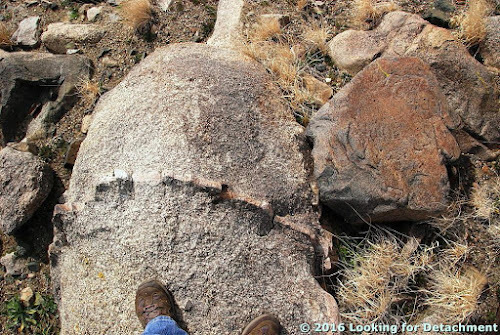 Done with my brief shoreline study, I walk back down to the bouldery shoulder, thinking that I'll eventually examine the intriguing contact across the wash.
First, I'm distracted by the granitic boulders. This one has a nice pegmatite dike cutting across, weathering out in relief. Then I'm distracted by these little wildflowers growing on, near, and all around the granite boulders. 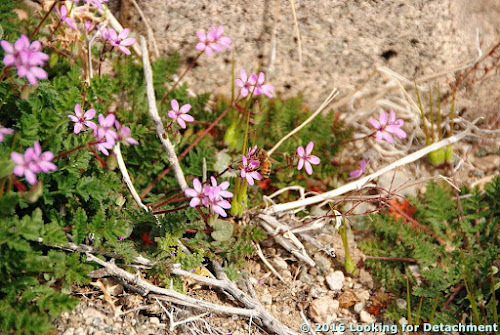 This is some kind of filaree or storksbill, probably Erodium cicutarium. 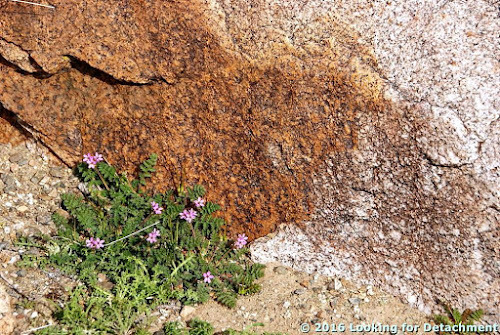 Perhaps I got carried away (and didn't get to the contact across the wash) because this was the first wildflower spot of the trip. The bouldery slope seen from below. I turned my sights to the east, to the western range front of the Gillis Range, where I could see more ancient Lahontan shorelines. This part of the Gillis Range is called the Agai Pah Hills. 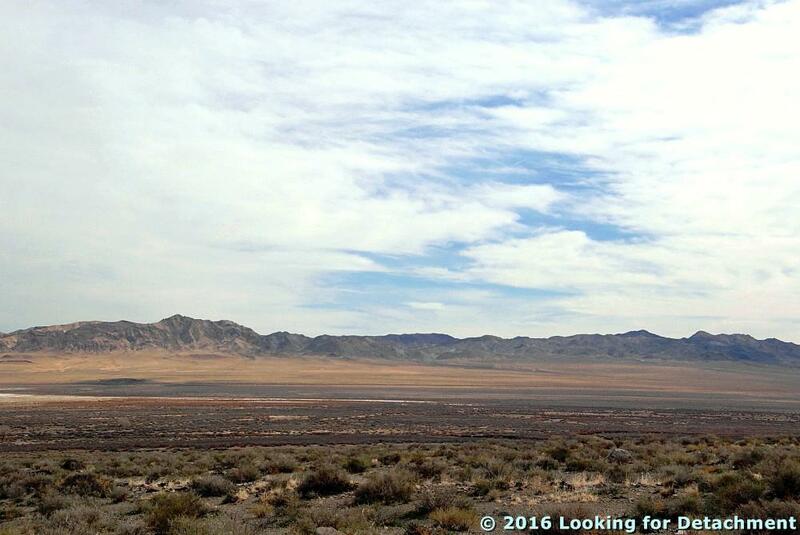 Back at the Jeep, I looked off to the northeast, to a broad, flat area really out in the middle of nowhere. I decided to test out my 300mm zoom (450mm in 35mm equivalent). The closer, rocky hills don't have a place name on USGS maps. Red Ridge is the name of the lower hills beyond that; the mountains beyond are the Sand Springs Range, south of Fairview Peak. 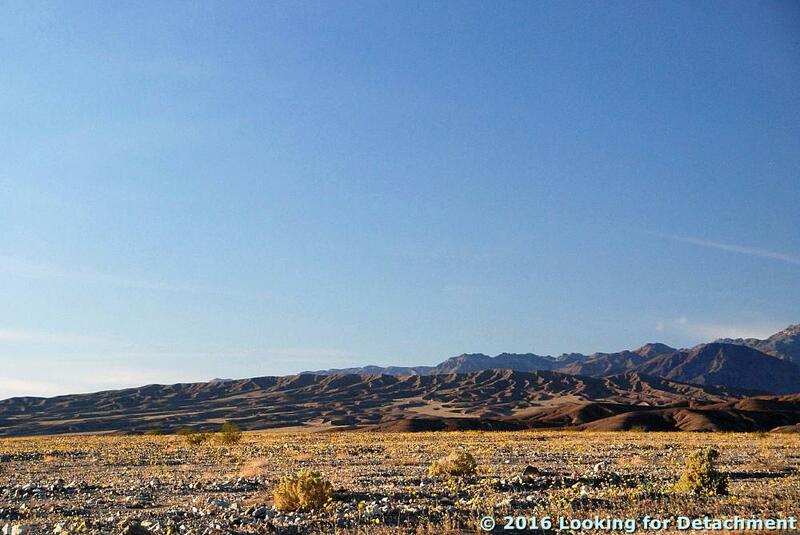 We continued on our way, southward toward Hawthorne, Mina, Coaldale, Tonopah, and Beatty. Our trip began like this, although I didn't get any photos the first day, as we drove south, then east, then south again under fabulous wave clouds. It began with a bit of a rumble: The Jeep went into a noisy, rattling shimmy upon reaching 45 mph, and we had to pull into a tire shop. We got the tires balanced, ate lunch at a local diner—a lunch that included two large, old fashioned chocolate milk shakes—and went on. We drove south with the high wind aloft evidenced by continuous and co-mingling stacks of wave clouds coming off the long linear range to the west. 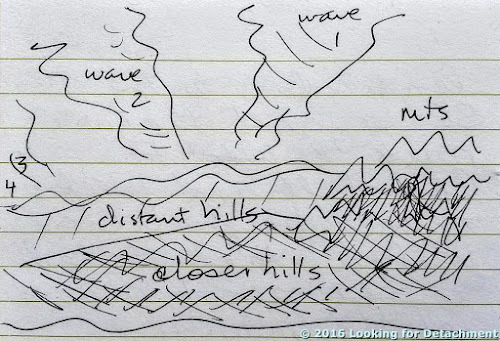 The waves were stacked almost indefinitely out over the Honey Lake basin and beyond, where they were coalescing into a high, thick stratus layer. Approaching the first Red Rock turnoff, with Peavine not yet in view, the lenticulars came into their own, at first disintegrating from a near mass into many wispy and shredded lenses, and then turning into three or more parallel roads in the sky: the primary wave off the Sierra Nevada and the Carson Range, the secondary wave perfectly parallel to the first and a little ways off to the east, and the tertiary and quaternary waves ... well, they were there, but they were beginning to merge together, or to merge with the primary and secondary waves off the Virginia Range—close in they would appear as individual sets of stacked waves, farther out they would pile up against each other in a kind of jumbled mass, and even farther still they would metamorphose into a fluffy, wavy blanket. 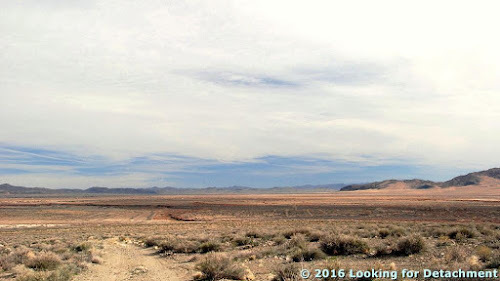 The way it looked, sans color, when we began our trip down to Death Valley, looking south near Reno or Carson, 27Feb2016. A couple times, as we drove south and then east, I reached a state of mind that I first noticed a long time ago when flying in some airplane: In this case, sitting in a Jeep while effortlessly driving, I seemed to be standing still while the mountains, clouds, roadcuts, and other drivers moved—instead—around me, as though I was in the middle of some 3-dimensional movie with the props being rapidly changed for my benefit. When I feel this way in an airliner, it seems as though I'm not going anywhere; instead, I'm just in some giant, crowded box, and people outside, who I can't see, are somehow shaking the box to simulate vibrations and turbulence, while they also somehow roll a scenery tape by my window. Before I got on the plane, the props (buildings, streets, people, everything) made the place look like Reno; by the time I got off, all the props had been changed to make it look like Alaska (they changed the buildings, streets, and people, and added steeper mountains and maybe some snow). 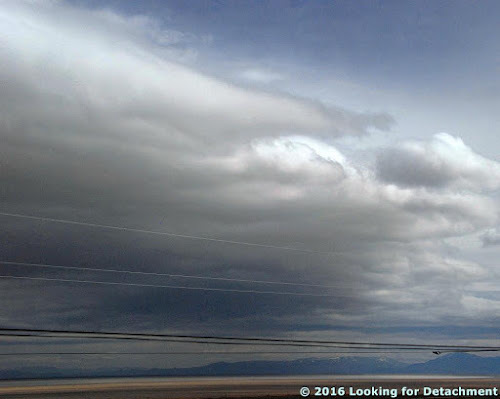 At Dayton, we drove under the secondary wave off the Carson Range, which was now a vivid, grayed yellow, almost the color I associate with incipient funnel clouds. The cloud overhead was colored something like this. A few tiny sprinkles hit the windshield of the Jeep, barely dusting it. The stacked lenticulars to the southeast, out over the Pine Nuts and beyond the river route to Ft. Churchill and Weeks, turned bright golden yellow, then faded to soft peach mixed with salmon, then faded even more to a soft pink. The distant hills past Talapoosa turned bright pink, lit by the last bit of alpenglow. The river route from Dayton to Weeks (Weeks is the spot where the Carson meets Alt-95). The map is courtesy USGS. We didn't take the route, though it can be a nice drive. 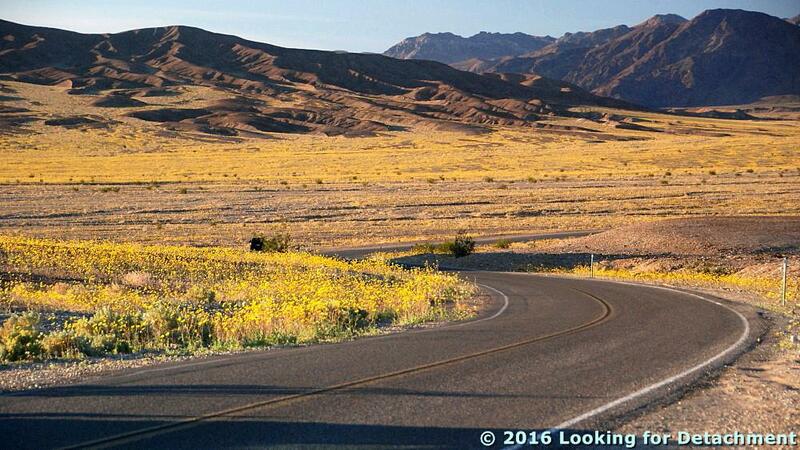 It can also be long and washboardy and is best driven during the day (unless you know the road). Dark colors took over the skies as we turned SE onto the Ramsey-Weeks cutoff, and darkness set in. 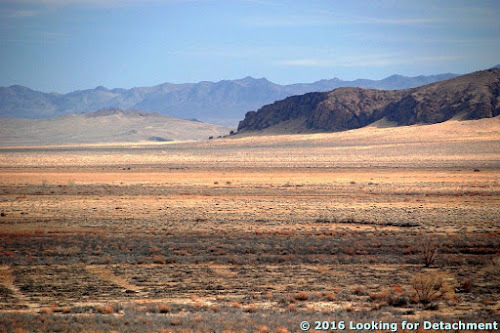 We drove into headlights, coming finally to a town we hadn't intended to stay in (we thought we would reach Tonopah the first night, but our delay at the tire shop changed our expectations). We had an average Mexican dinner, accompanied by exceptionally hot salsa and lackluster margaritas. We found a nice, cheap room and settled in for the night. You can see the first part of our trip on this map, although the default view will change with more recent posts, so you might have to page around to find the first, northern leg. 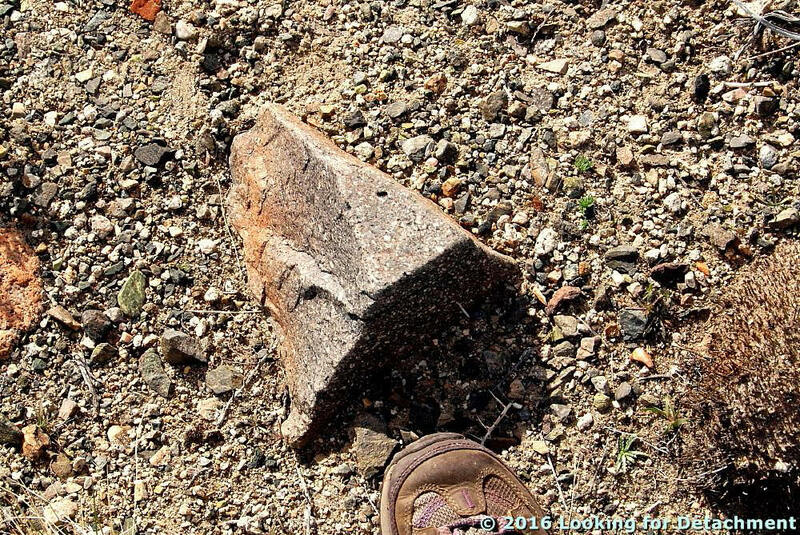 The two photos were taken at Honey Lake rest stop on 3Mar2016. 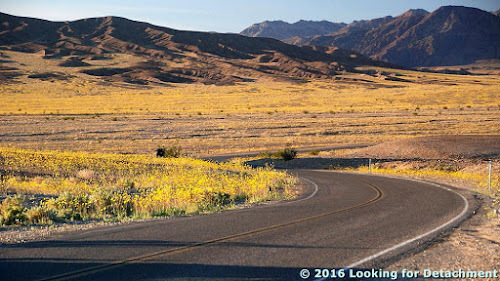 We're still on the road in Death Valley and have stopped between the turnoff to Natural Bridge and the southern entrance to the one-way Artist's Drive to look northeastward toward the Black Mountains. 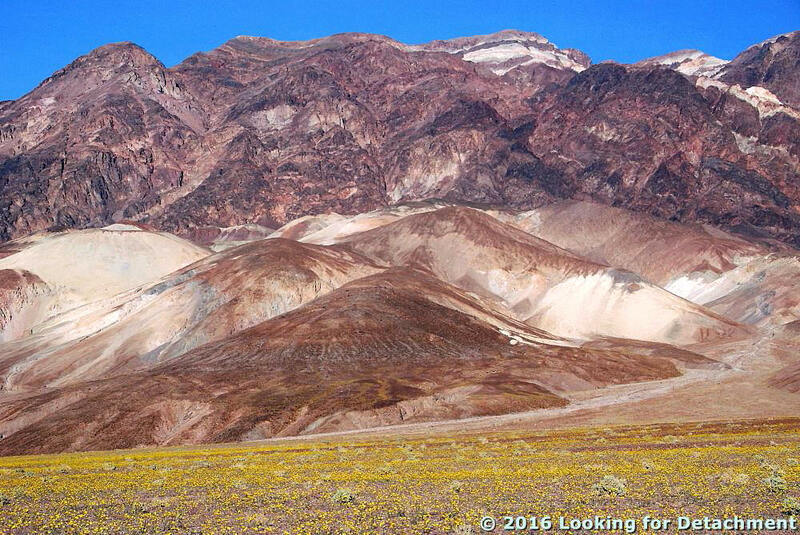 Geology is everywhere in Death Valley, whether you look up or down, north or south, east or west. 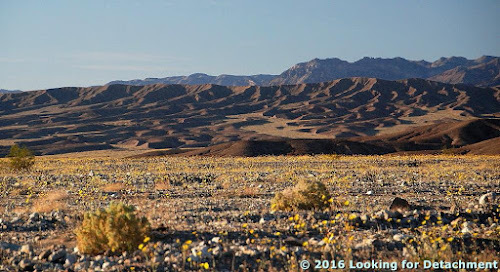 Consequently, although MOH and I were there mostly to see this year's "superbloom," the lion's share of the photos we took show a lot of geology, which I could only arm-wave or guess at when driving through. I've done a bit of research in these several days after getting back, read a few things, and looked at a map or two (see references below), thereby reacquainting myself with the general geology of the area. 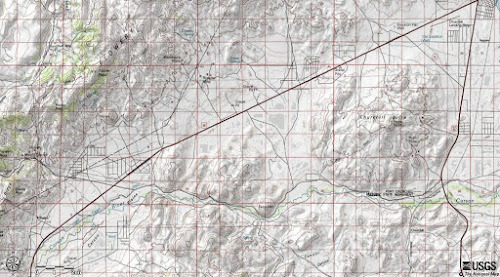 For this post, I'll mostly be using the geology, including formation abbreviations, from this USGS map and accompanying report. 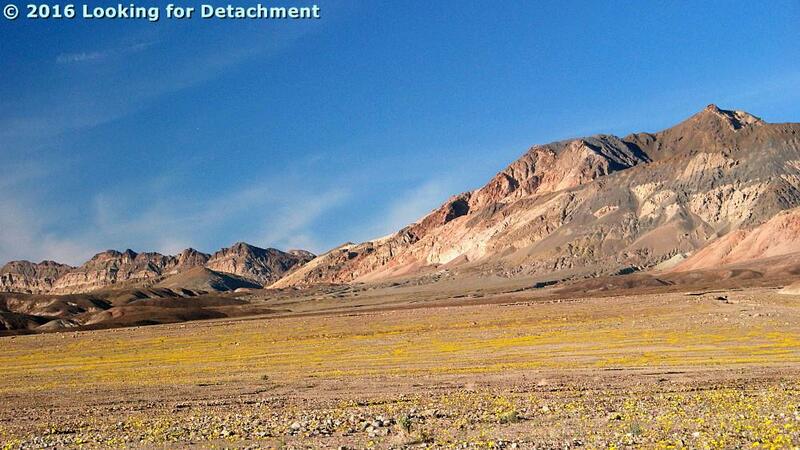 So, what do we see in the first photo, besides a nice carpet of desert gold on the alluvial fan in the foreground? Well, I see a seemingly messy pile of white, buff, gray, and brown slope-forming rocks in front of reddish and brownish cliff-forming rocks, with the highest parts of the mountain topped by white, gray, pink, and brown layers. I suspected that the lower, rounded hills would correlated with the ashy layers occurring along Artist's Drive (the Miocene Artist Drive Formation), but I was wrong. Workman et al. (2002) mapped the lowers hills as Tvg: These are part of the 5.4 to 6.0 Ma Greenwater Volcanics, which consist of rhyodacite flows and ash-fall tuffs. The dark rocks in the cliffs behind the low hills are 8 to 12 Ma rhyolitic to andesitic flows and tuffs, mapped as Tar, with a couple thin, lighter-colored layers of what they map as Ts4: undifferentiated Pliocene to Miocene sedimentary rocks. Ts4 seemingly includes the Miocene Artist Drive Formation, although they don't specifically mention it in their report. The mountains are capped by the same ashy volcanic rocks that are in the low hills, possibly offset by faulting: The map shows two presumably normal (though not labeled) faults between the Tvg of the low hills and the Tvg capping the cliffy part of the Black Mountains. Now, at the same location as in the first photo, we're looking north toward Artist's Drive, which is in the low area just left of center. The low, dark hills in this second photo are composed of the Greenwater Volcanics (Tvg). Everything else is a jumble (or dog's breakfast) of lighter-colored rocks mapped as Ts4 and brownish gray rocks mapped as Tb—i.e., a pile of faulted and interbedded (?) Artist Drive Formation (mapped as Ts4) and basalt (Tb). 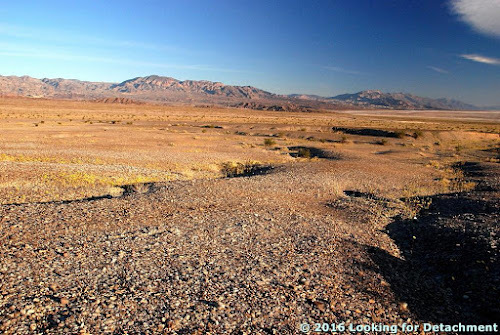 Once again, MOH and I drove quickly through the Furnace Creek area without stopping, to continue northward. We finally came to the turnoff to the Daylight Pass cutoff at Beatty Junction. The next photo is from just after the turn onto the cutoff road. Looking NE, with a low part of the Grapevine Mountains in the background. 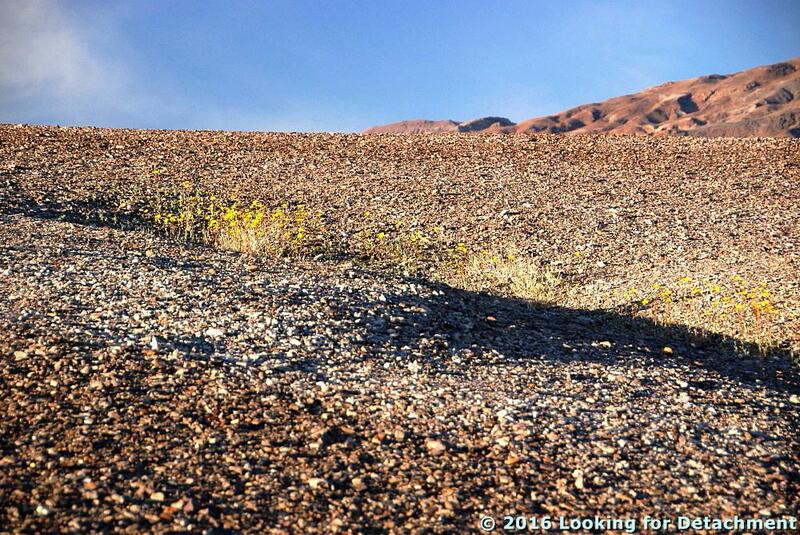 The low, dark brown hill beyond the desert-gold-carpeted alluvial fan is underlain by Ts4 (Artist Drive Formation?). 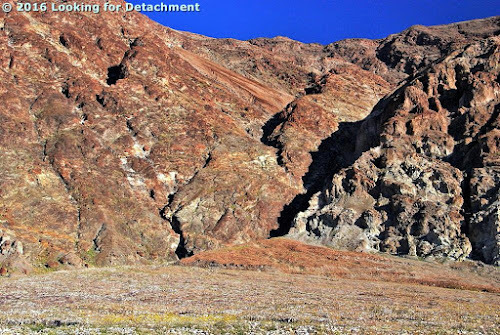 The intricately dissected, crinkly hills just beyond, with numerous alluvial fans covered with desert gold, are underlain by what is mapped as QTa, or "oldest alluvium," thought to be middle Pleistocene to late Tertiary (Workman, et al., 2002a). 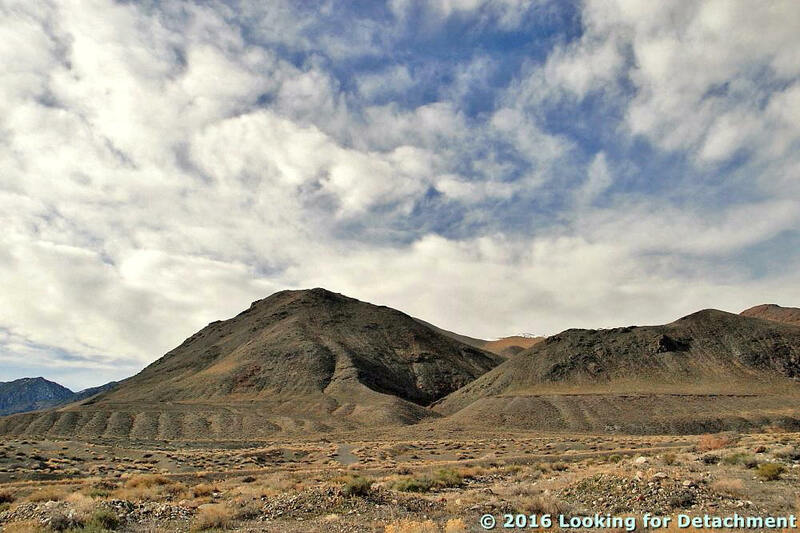 The jagged-looking hills beyond, a low part of the Grapevine Mountains, are underlain by various Cambrian sedimentary formations. As we drove a little farther up the road, the light was getting low. 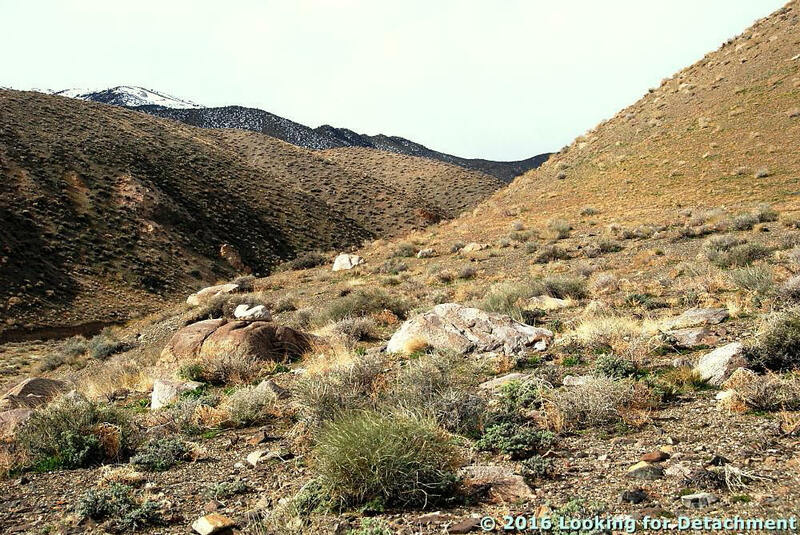 Here we're looking southward toward the the 11,048-foot high (3367 m) Telescope Peak, barely visible behind closer ridges. Wildrose Peak is the rounded peak on the right; the peaks to the left include several unnamed ones along and above Colville Ridge. 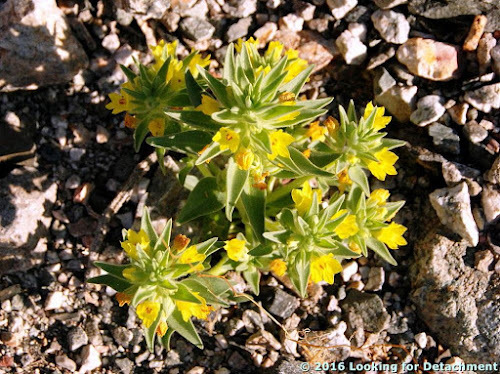 Now we're standing on what looks like average desert pavement, with a little desert gold growing in a small rill. 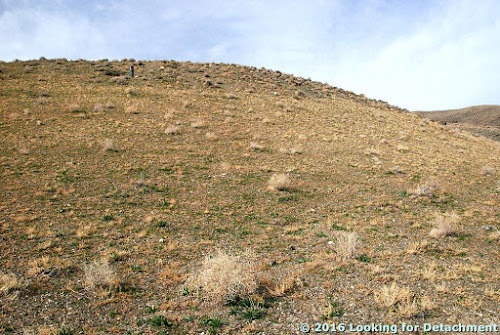 It turns out that this graveled hill is underlain by what has been mapped as Qlc, "old lacustrine deposits" (Workman, et al., 2002), which are late to middle Pleistocene in age. 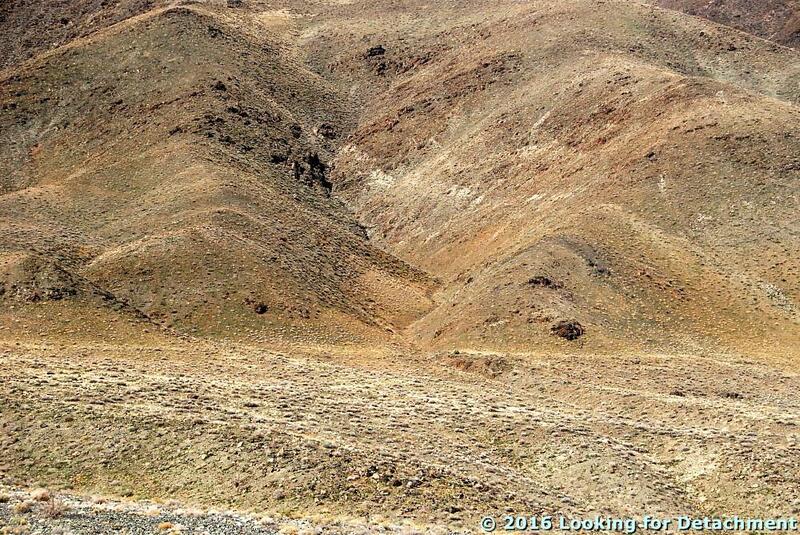 In fact, this is one of two linear ridges, as seen below in a Google Earth image. 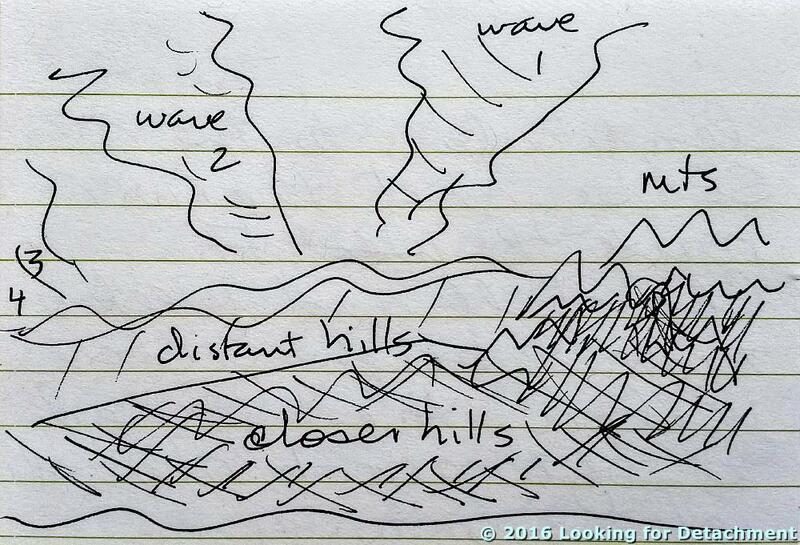 These might be old spits or bars, and they are marked by lines that might be shorelines. 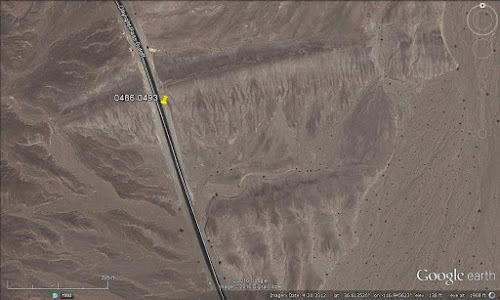 Google Earth image showing two linear ridges (Google Maps link). The pin marks the approximate location of 3DV006-009 (the previous two photos and the next two). Bright desert gold (Geraea canescens) on brown, wrinkled hills of QTa (oldest alluvium). 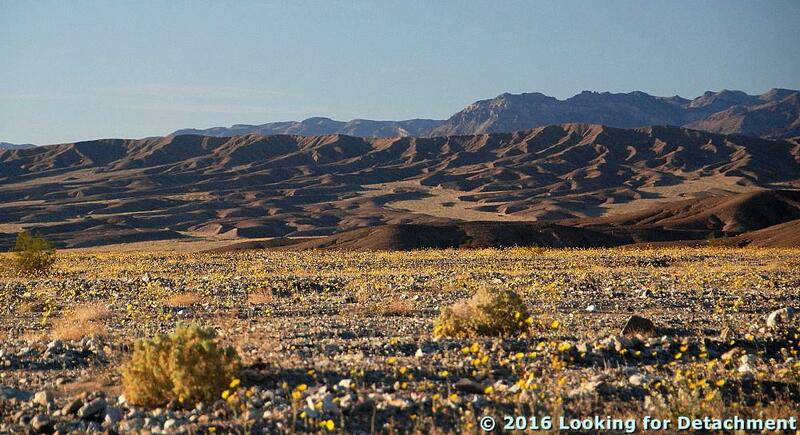 The dark hill on the right is part of the Death Valley Buttes, which is underlain by CZw, the Cambrian-Precambrian Wood Canyon Formation. Desert gold along one of the rills running southward off the linear ridge. 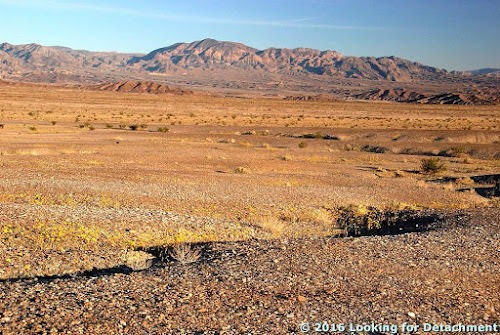 The dark brownish, low hills beyond the lacustrine ridges and alluvial slopes are composed of more Ts4 (I'm not qualified to say it's Artist Drive Formation), and the high country beyond is part of the Funeral Mountains, largely underlain by late Precambrian and Cambrian rocks. 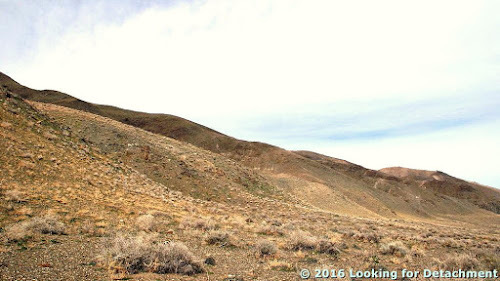 The tilted rocks in a hill or mountain just right of center is shown as Cnbc on our map: the Cambrian Nopah, Bonanza King, and Carrarra Formations. 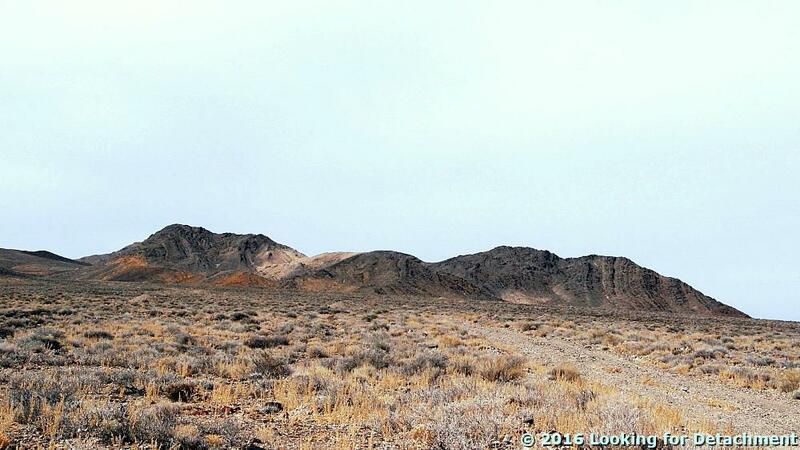 In general, it's the lower far hills and the mountains to the left that are underlain by Precambrian rocks. While we were stopped at the roadcut through the liner ridge, a photographer told us we should look out for a particular desert five-spot that he had put a rock ring around, which would be up ahead near Milepost 8. Apparently the five-spot is considered one of the more beautiful of the myriad desert flowers, and it is sometimes described as rare. 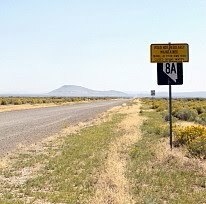 We drove north up the cutoff road, diligently looking for Milepost 8. Just when we had given up on seeing any mileposts (where were they? hidden? were we distracted by wildflowers and geology?? ), we found MP 6. From there we counted our way slowly, and pulled over right next to MP 8. Where was the rock ring? It wasn't far uphill from MP 8, right alongside the road. 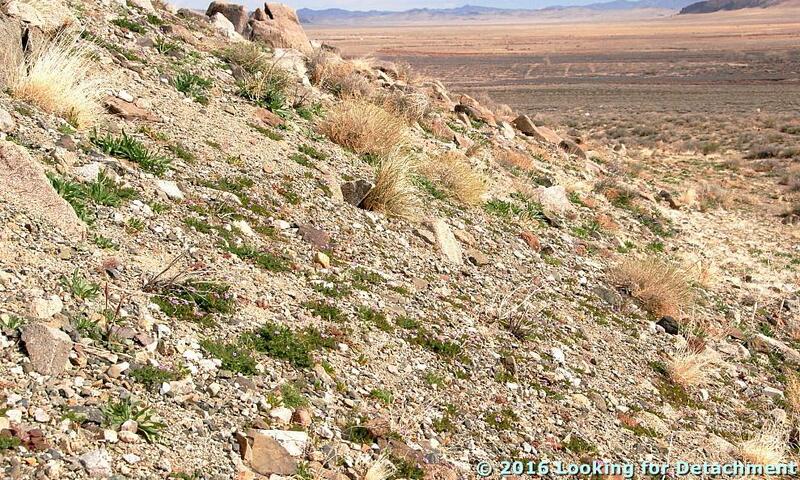 Desert five-spot (Eremalche rotundifolium) inside a circle of rocks. 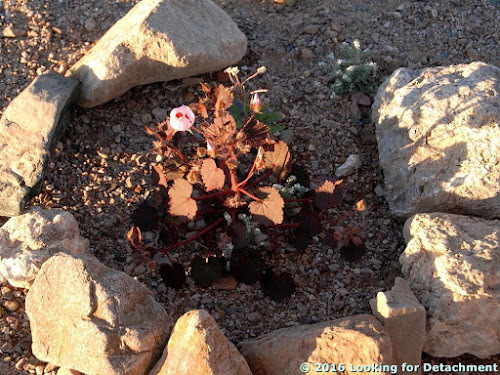 The location of this plant (and all the photos) can be seen in the embedded MyMaps map, below. 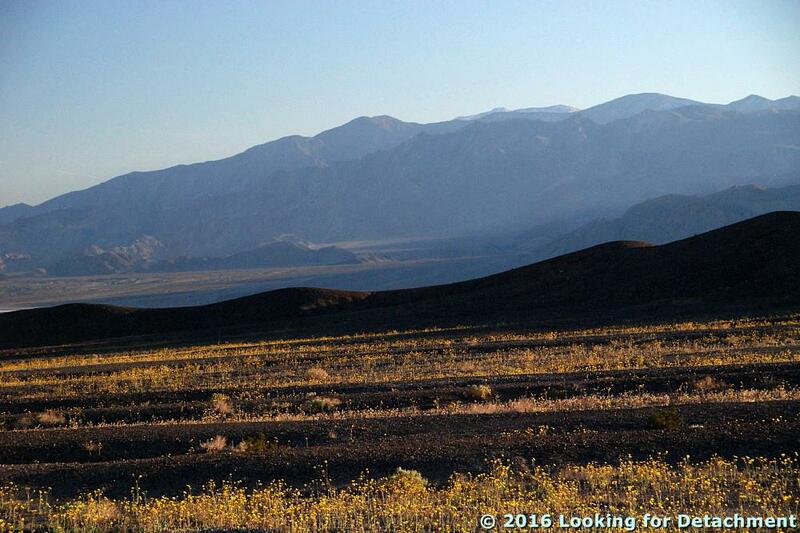 The sun was low, we were hungry, so onward and upward we rolled, turning back to take one last photo or two looking south toward the mostly shadowed Death Valley. Looking south toward the Death Valley playa. Once again, the low, dark brown hills are underlain by Ts4; the wrinkly hill of oldest alluvium that we saw earlier can be seen to the right of the dark hills. 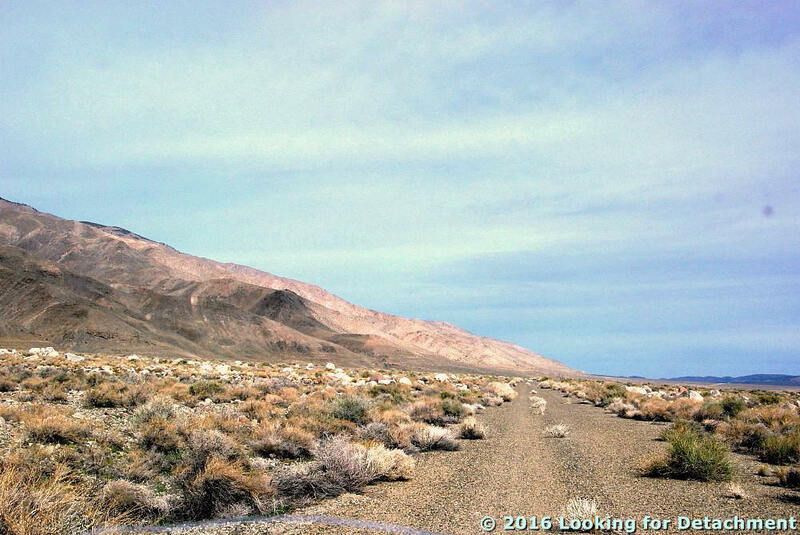 Telescope Peak is the faintest, snow-covered peak in the distant Panamint Range, on the right; the Badwater and Mormon Point Turtlebacks can be seen in silhouette on the left, far down the basin toward and beyond Badwater. 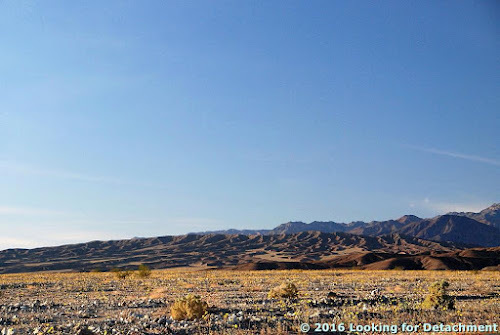 This post ends the first day of our Death Valley wildflower trip, although I haven't yet posted about the Titus Canyon leg of this journey. Part 1 was here, Part 2 here. This is Part 3. 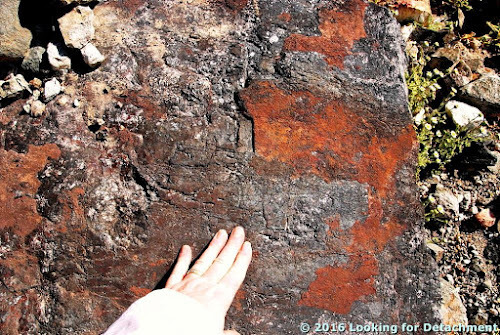 There has been a geologic component to all of these posts, so far. How could there not be? 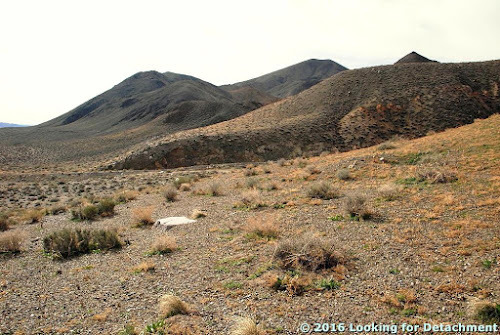 Greene, R.C., and Fleck, R.J., 1997, Geology of the northern Black Mountains, Death Valley, California: U.S. Geological Survey Open-File Report 97-79, 110p. 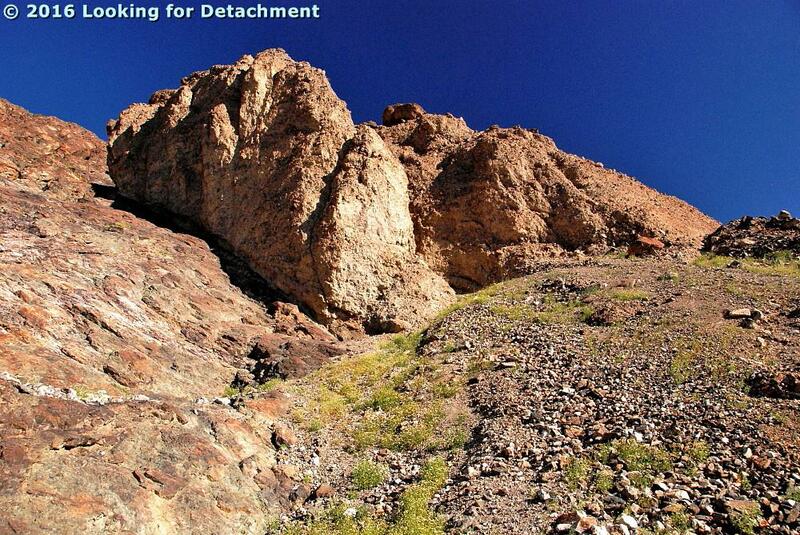 Hunt, C.B., and Mabey, D.R., 1966, Stratigraphy and structure, Death Valley, California [pdf]: U.S. Geological Survey Professional Paper 494-A, , 162 p.
Lengner, K.E., 2009, A trip through Death Valley's geologic past: Deep Enough Press, 66 p.
Lengner, K., and Troxel, B.W., 2008, Death Valley's Titus Canyon & Leadfield ghost town: Deep Enough Press, 175 p.
Miller, M.G., and Pavlis, T.L, 2005, The Black Mountains turtlebacks: Rosetta stones of Death Valley Tectonics [pdf]: Earth Science Reviews, v.73, p. 115-138. Troxel, B.W., and Wright, L.A., eds., 1976, Geologic features, Death Valley, California [pdf]: California Division of Mines and Geology Special Report 106 [several articles]. Troxel, B.W., and Wright, L.A., 1987, Tertiary extensional features, Death Valley region, eastern California [pdf]: in Hill, M.L., ed., DNAG Centennial Field Guide v. 1, Cordilleran Section: Geological Society of America, Boulder, p. 121-132. Workman, J.B., Menges, C.M., Page, W.R., Taylor, E.M., Ekren, E. B., Rowley, P.D., Dixon, G.L., Thompson, RRA., and Wright, L.A., 2002, Geologic map of the Death Valley ground-water model area, Nevada and California: U.S. Geological Survey Miscellaneous Field Studies Map MF-2381-A, Pamphlet text, Sheet 1, Sheet 2. Wright, L.A., Otton, J.K., Troxel, B.W., 1974. 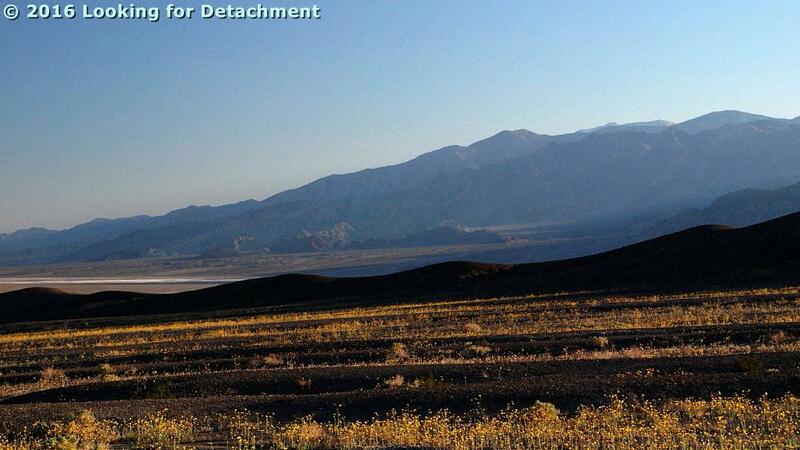 Turtleback surfaces of Death Valley viewed as phenomena of extensional tectonics [abs. ]: Geology v. 2, p. 53-54. The crinkly, wrinkled hills in a wider view. 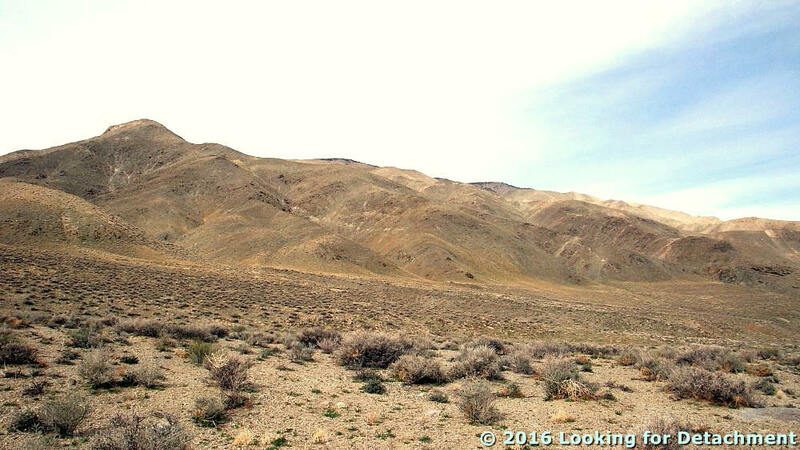 A zoomed view of desert gold and the Panamint Range, with Telescope Peak a little more apparent than in the earlier, wide-angle view. A wide-angle view from the linear ridge. All photos in this post were taken on Leap Day, 29Feb2016. If you remember from a couple days ago, toward the end of the first of, hopefully, a few more posts about our trip to Death Valley and vicinity, we had walked up an alluvial fan down near Badwater and were looking at the Badwater Turtleback fault, which is essentially the entire range front above. Specifically, we were at the smooth, olive-brown surface on the far right edge of this first photo. Not incidentally, these photos were all taken during the early days of this year's Death Valley "superbloom." 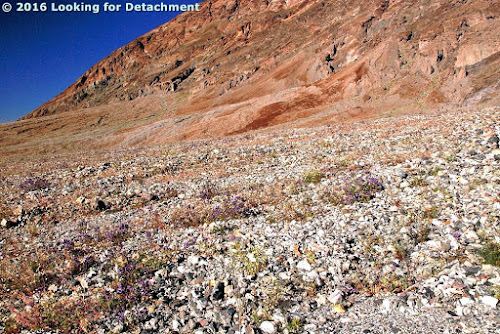 We'll see some wildflowers in this post, but I'll be concentrating on the turtleback or detachment fault surface and not the flowers. 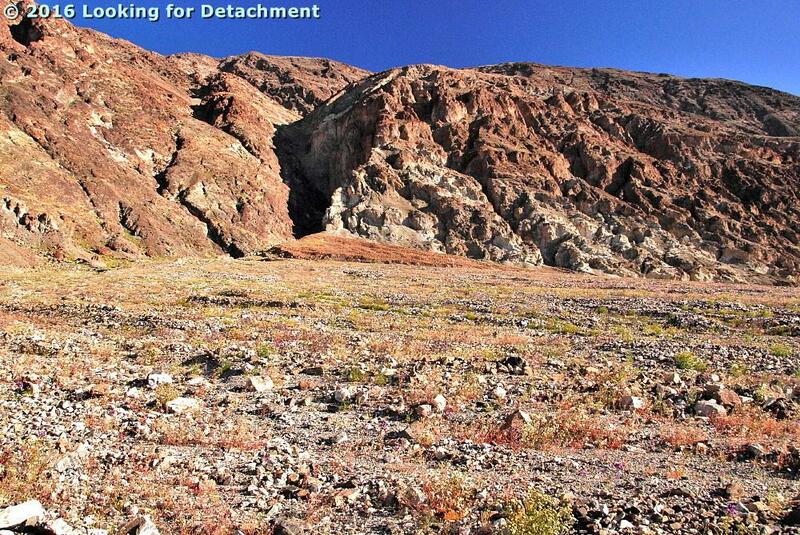 The Badwater Turtleback fault surface, looking north. Part, but not all, of the apparent curvature in this photo is from the 18mm wide-angle view (27mm in 35mm equivalent). I was surprised to find what looked a lot like Quaternary or late Tertiary alluvium—alluvial fan, talus, or basin fill deposits—sitting in the upper plate of this fault, so I took quite a number of photos. The apparent dip on the alluvial deposits is shallow, dipping slightly back to the east. This is only apparent dip, however. I wondered if the older alluvium (older than the material on the active fans we had just hiked up) had been deposited right against the fault plane (the turtleback faults are often exposed, with hangingwall rocks having been stripped of by post-fault erosion), or if the deposits were, indeed, cut by the fault. 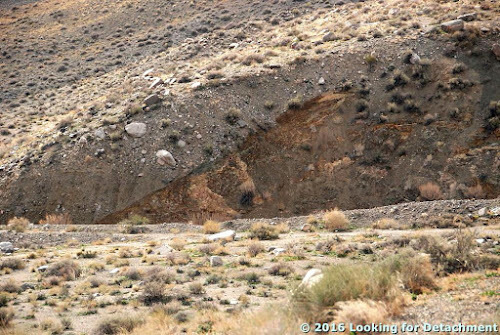 If I could just get closer—close enough to touch the fault plane or the deposits—maybe it would be clear that this was a bunch of post-fault debris covering the fault. I couldn't, and it wasn't. The light brown, fairly poorly sorted material is definitely in the hangingwall of the fault: while there I could see visual evidence of shearing. In this photo, you can see a more steeply dipping fault cutting the fan deposits in the hangingwall of the main shear zone. 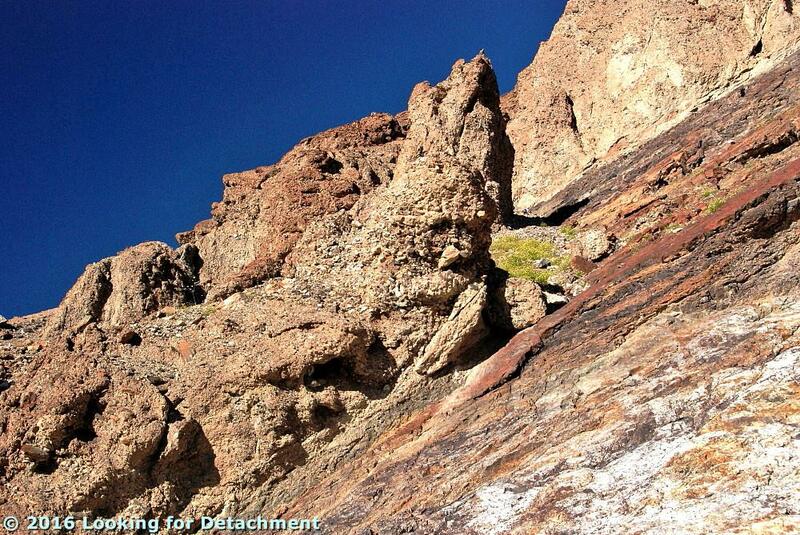 The slightly steeper hangingwall fault may flatten toward the main shears, but that's really unclear. When checking out the literature after the trip, I found that, indeed, the hangingwall of the Badwater Turtleback fault or detachment does contain Pleistocene fanglomerate deposits (Miller and Pavlis, 2005). 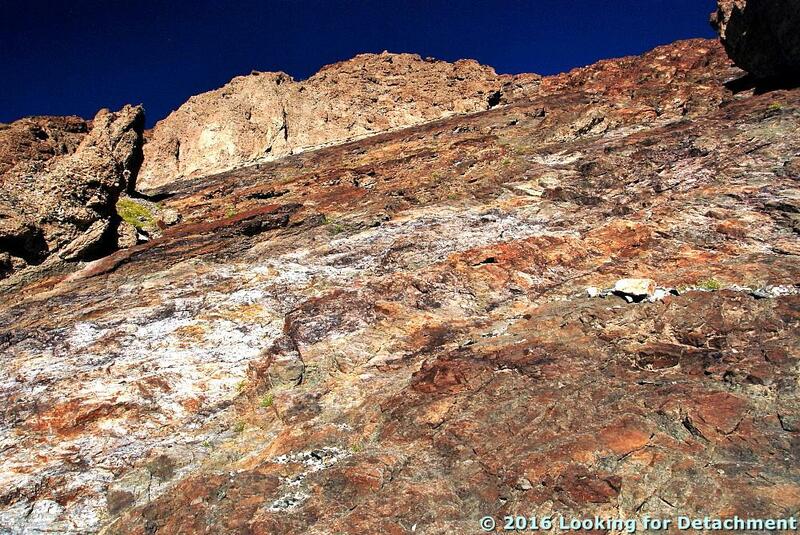 Here we're looking up the plane of the fault surface, a kind of disorienting view. The shadowy blob in the upper right (above) is part of the same shadowy surface seen in the next photo (below), and the light colored mass that looks like it's about to slide down on the photographer (me!) is another, larger mass of hangingwall fanglomerate. 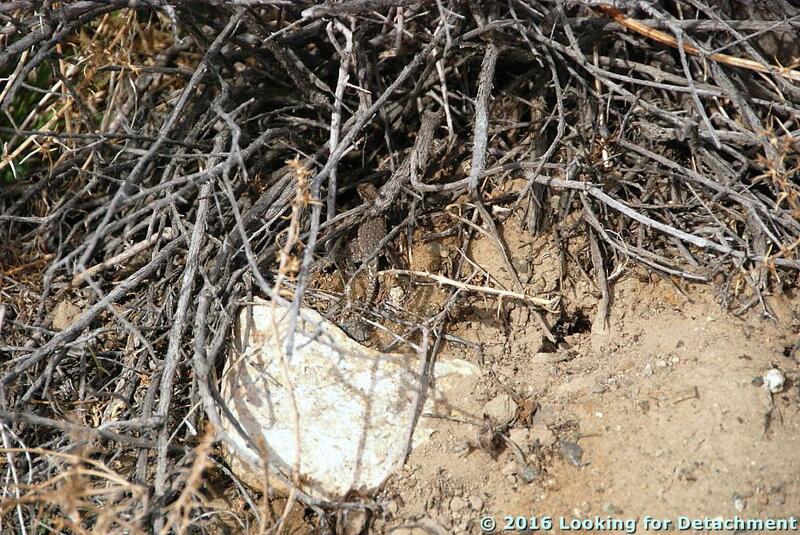 This photo shows more older alluvium in the hangingwall of the turtleback fault surface, with the younger alluvium of a talus cone to the right. 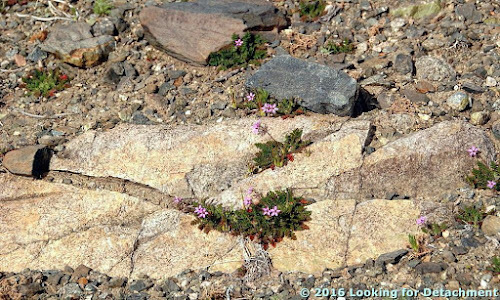 Notice the nice greenery with smallish flowers on the talus. I scrambled upward near the base of the turtleback, but the terrain was a lot steeper than it looks in these photos, and the heat was getting to me some: although it was only 87° F (cool by Death Valley standards), it was a lot warmer than the 30s to 60s that I was accustomed to. Also, I had taken a scary tumble in Titus Canyon earlier that day, and wasn't comfortable with the steep slopes. I probably would have benefited from sturdier boots. 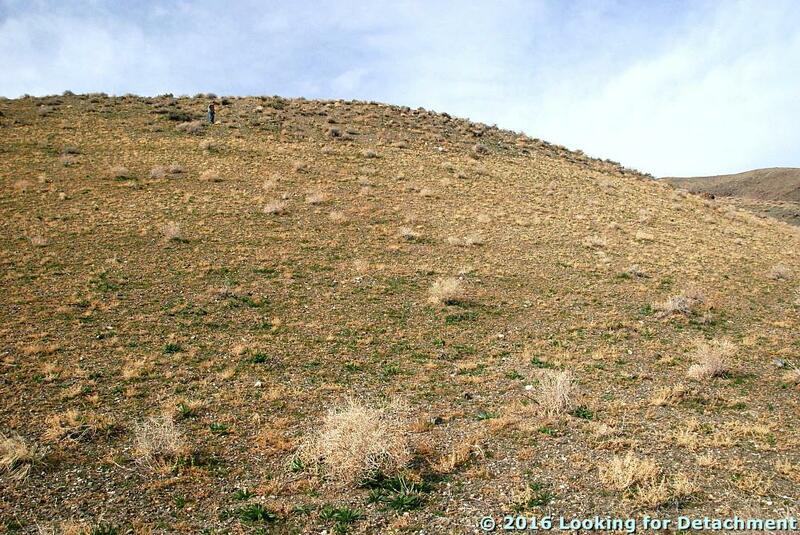 MOH looks up at the fault plane on the south side of the little drainage area or canyon near the base of the turtleback surface. The same surface, perhaps a little closer. Because I couldn't get right up on the fault, I took these photos of a slickensided surface in float. Also, these tiny flowers—white with yellow centers like little daisies, tiny purple blooms, and others—were everywhere along the talus-ridden slopes. The faint slickenlines are running across the photo here (same piece of float). We walked back down the fan. 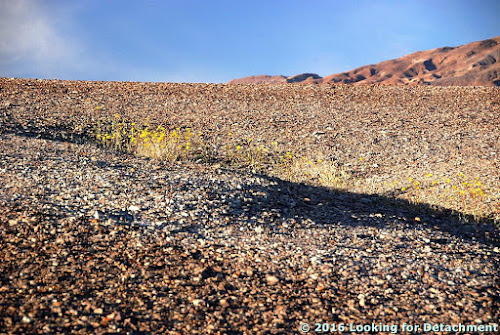 It was easier going down, as it usually is, and I took a line more in tune with the recent rills and rocky, sandy washes, which no doubt ran last October when storms washed out numerous roads in the Death Valley area. The turtleback fault plane is exposed in the shadows of a "slot" canyon just south from where we hiked up. Note the greenery with tiny wildflowers all across the fan. And here's one of the tiny flowers. Does anyone know what this is? 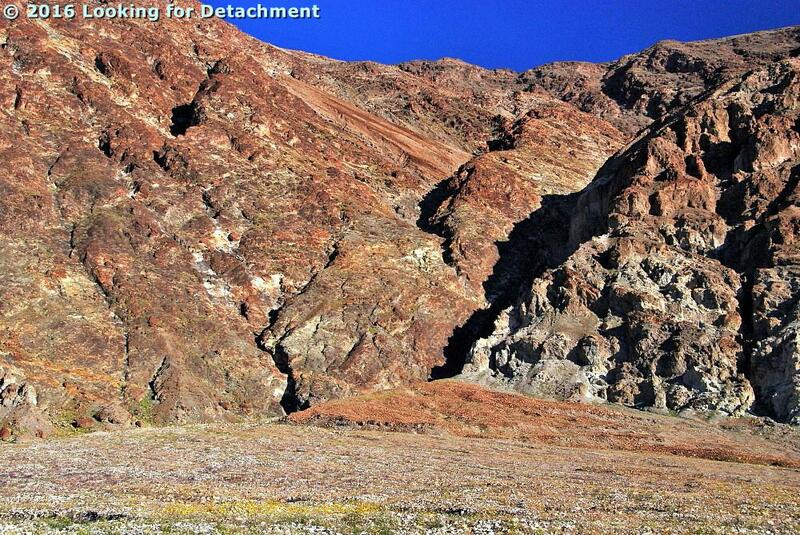 The Badwater Turtleback fault and a bit of desert gold. 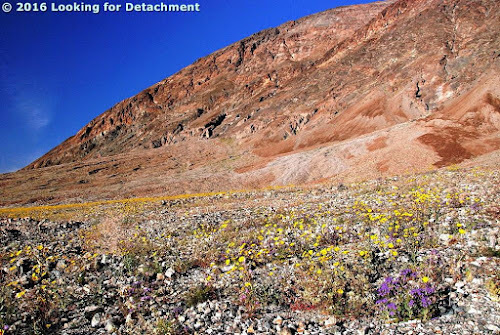 We take one last look at the alluvial fan, the flowers, and the Badwater Turtleback. 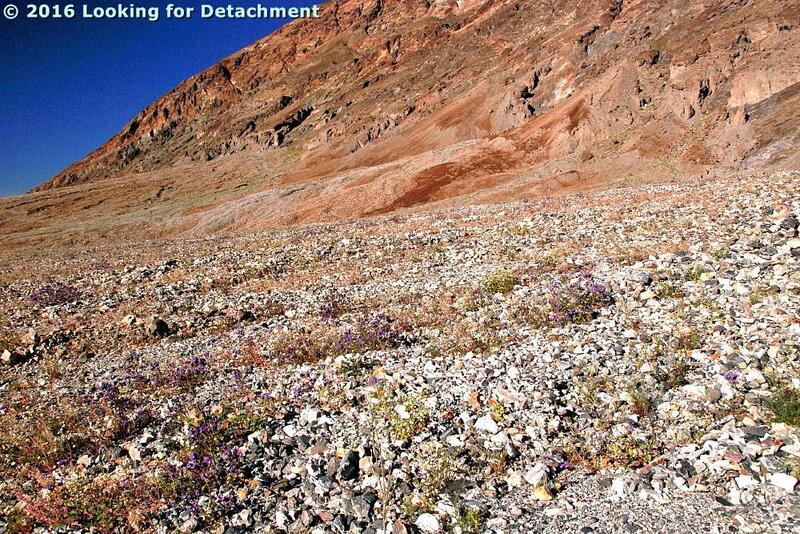 The flower show is dominated by yellow desert gold and purple notch-leaf phacelia. 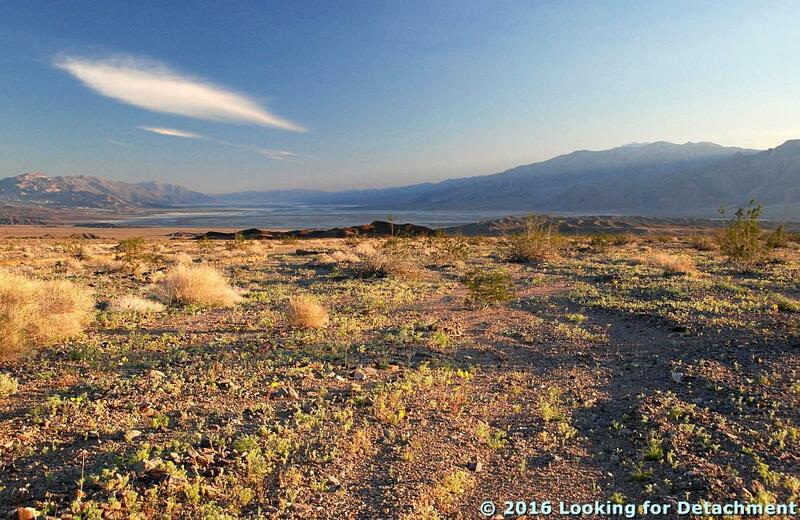 Say goodbye to Badwater, before we head north. 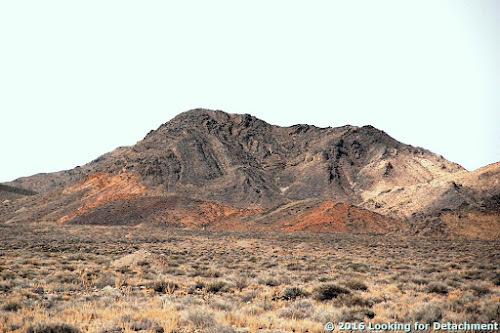 Miller, M.G., and Pavlis, T.L, 2005, The Black Mountains turtlebacks: Rosetta stones of Death Valley Tectonics: Earth Science Reviews, v.73, p. 115-138. 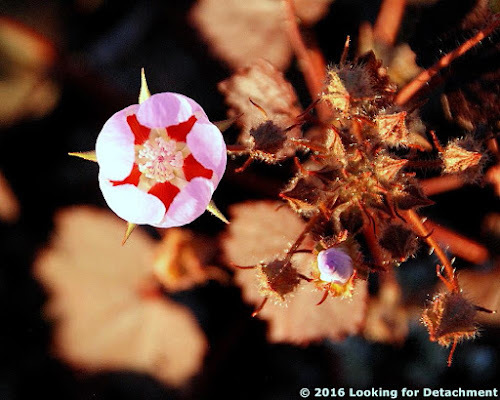 All photos in this post taken on Leap Day, 29Feb2016.